I want to start off by talking about the conference and then I will do a post later on about the actual cruise experience. I have a few crazy stories to share, so you don’t want to miss it. 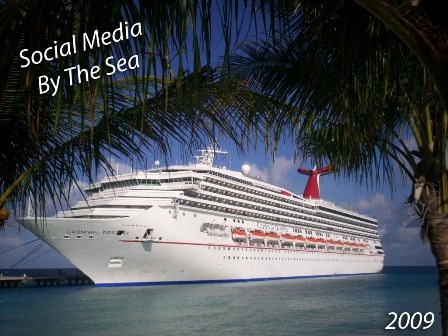 But in this post I would like to share about the First Social Media by the Sea – Cruise / Conference. I was asked to speak back in December of 2008 for the conference, which was known then as the Twitter by the Sea Conference. The name has been changed to Social Media by the Sea so that there could be a broader target, which I think is a great idea. After all, Twitter and many other sites fall under the “Social Media” category. Blogging can also fall under the social media category because it is a means of networking as well. 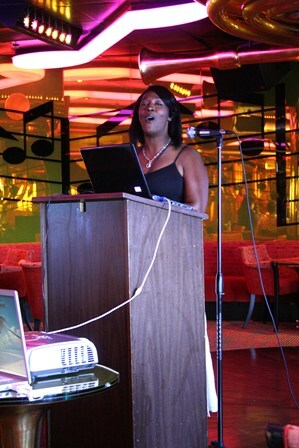 My speaking presentation was on Blog Design. 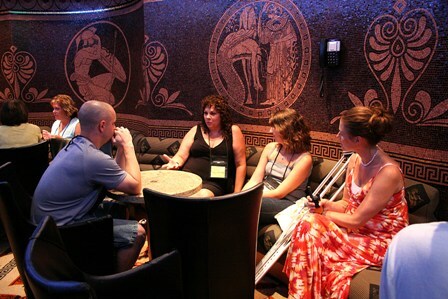 The first night of the cruise, we had a Welcome Party where all of the speakers and attendees got together to ask questions and share. They did something really fun called “Speed Networking”. It is a spin off of speed dating. We went around the room in 5 – 10 minute increments, introducing ourselves to everyone and sharing about ourselves and our businesses. The following day was the first conference session. I spoke along with @WillieCrawford who is a well known social media expert and Jen Grant (@Cre8tive) who is a Social Media Strategist with Intrapromote. They were awesome! And even though this was my first speaking experience, they really made me feel at home. Here is a picture of me getting started with my Powerpoint presentation. On the last session day, Michelle Price (@prosperitygal) shared on using social media to market your business. The final speaker was Willie Crawford who came back and spoke on how to monetize your blog or website. He shared some great tools on how to make your site work better for you. Everyone did a great job! I learned so much! I want to give a special thankyou to Sharnese Lanier (@SharneseLaNier) for putting all of this together. We definitely had a lot of ups and downs. This was a huge learning experience for all of us who had no prior conference coordinating experience. I saw the vision that Sharnese had and decided to stay loyal and stick with it till the end. And in spite of the many obstacles, this event happened and not only that – it was GREAT! Here is a picture of Sharnese welcoming one of the speakers to the podium. I also want to thank our photographer, Jenny Marie of Jenny Marie Photography. She did a great job! All the photos included in this post are from her. I will be sharing my own in a later post – so stay tuned. I definitely recommend this conference to all of my readers! I will continue to show my support and assist in any way that I can. If you are a blogger or own a small business, this conference is definitely for you! 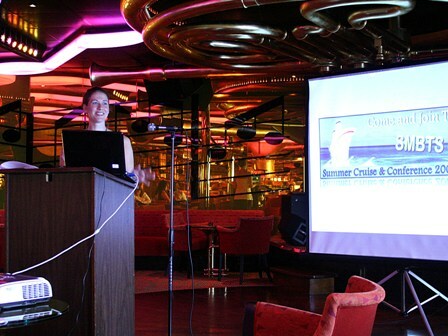 I was honored to be a part of the FIRST Social Media Cruise Conference and I can’t wait for the next one! Sounds like a wonderful experience! Glad you survived your first speaking gig! Welcome back! So how did you do on your presentation? You look very confident in the photo. So proud of you! I left a little something for you on my blog. Come see! .-= Teresha@ Marlie and Me´s last blog ..You Like Me! You Really Like Me! =-. It looks like ti was a fun trip, and the topics covered sound extremely helpful. Nice to make working a vacation. Congrats on your first speaking experience! I’m so glad things went great for this cruise. I hope you guys are able to have it again next year. .-= Felicia – I Complete Me´s last blog ..Who’s Running Your Household? =-. Now THIS looks like fun and had I take a cruise while pregnant I would have gained FAR more than the impressive 50 # I put on!! What’s the average time lapse between trips to the buffet?? Twelve minutes?? .-= Amy Kehoe´s last blog ..Put Down the Sudoku and Put on Your Tap Shoes! =-. 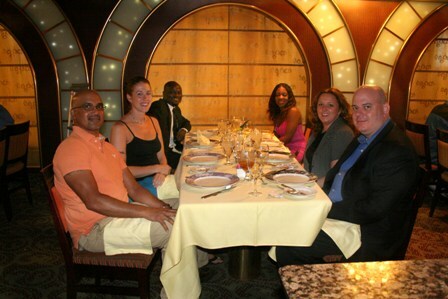 I am SO glad that everything went well on this cruise. I know that there were a lot of ups-and-downs in the beginning. This is a conference that I am definitely interested in attending next year. (Matter of fact, it is my goal to organize my own mini conference next year.) I am glad that you had so much fun and learned a lot while you were there. .-= Shynea @ Penny Pinching Diva´s last blog ..FREE TO CHEAP HUGGIES LITTLE SWIMMERS AT CVS =-.